Made a trip to Lafayette this past weekend, one of my dad's good friends unexpectedly passed away. Him and his wife were the family friends we met for lunch in Baton Rouge when we went to Fort Benning back in October (they'd driven over from Lafayette to meet us). Lafayette doesn't have much in the way of Tesla charging options, mostly auto dealerships (only accessible during business hours, so unavailable when we'd have been able to use them), RV camp sites, and an Electrify America (VW's penalty for dieselgate) site at Walmart which is one of the locations that doesn't support my car (only has CCS and CHAdeMO options, if it had J1772 I could have used it). None of the hotels had destination charging either, so we stopped at Lake Charles for lunch on the drive over and charged to 100%. From there to Lafayette was about 80 miles at highway speeds, and we had about 200 miles of range left when we got back to the hotel Saturday night. I turned on the new Sentry Mode at the hotel. Based on this I was expecting it to use about 1 mile of range per hour. A few hours later, just before I went to bed, I checked the car via the Tesla App and was surprised to see range had already dropped to 185. So I turned it off via the App. Looks like they have some more work to do on that feature. Like Texas, charging in Louisiana is by the minute rather than kWh. Without any destination charging, and having to charge to 100% (which takes about twice as long as charging to 80%) with per minute charging, it ended up costing $16.51 for about a 500 mile round trip. In contrast the trip to Fort Benning was $17.00 for ~730 miles (that's just to get there, didn't look at usage while at Fort Benning, nor for the return trip). 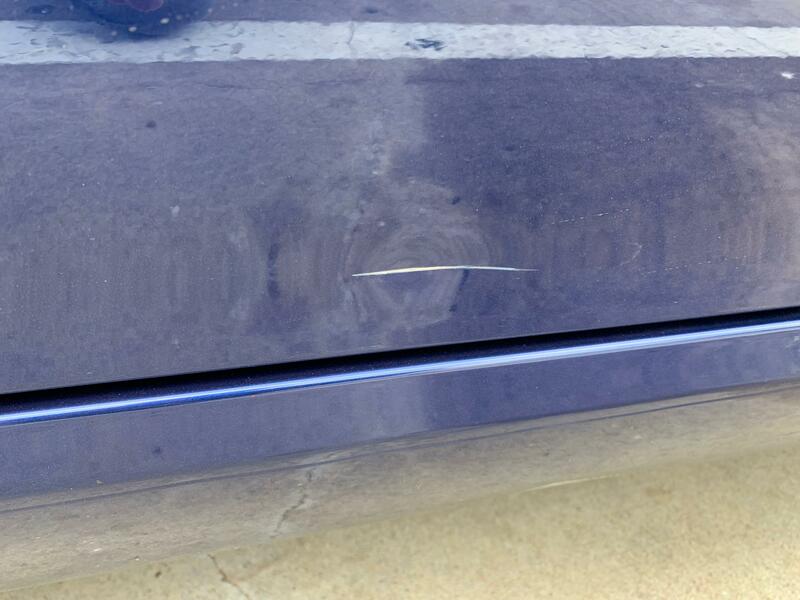 I ran over some debris on I-10 that bounced up and put a dent in the driver door and the strip below. 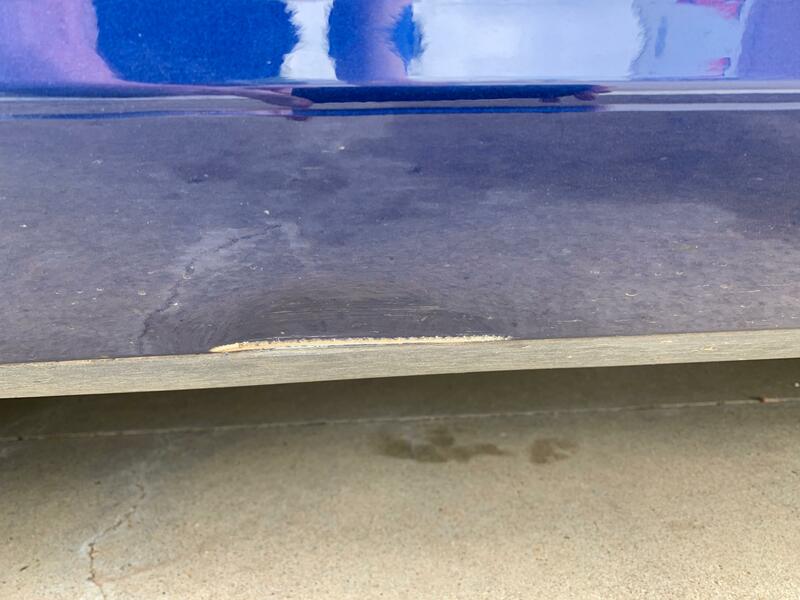 The scratch on the door is 2" (dent itself is larger) and the scratch on the strip is 4". When it occurred we thought for sure I'd punctured a tire, but I don't see any damage to it or the rim. Sorry to hear about your family friends. Also - too bad about the scratch and dent. About a week after I got my last car, some high school kid bumped into the back corner of mine, scraping a bunch of paint off the bumper. I never did get it repainted, since I knew there'd be more - working at a college there's just no point in trying to keep my car pristine. Now the parking lot dings are a time capsule of how long I've been there. At the appointment with a body shop yesterday for the appraisal - "We don't work on Tesla's as we don't work on aluminum". Gee, you couldn't have told me that on Monday when you scheduled my appointment? I found a list of Tesla Approved Body Shops and reconciled it with my insurance's list. Scheduled another appraisal for today. Have the appraisal, but this place no longer works on Tesla vehicles. They were having an issue getting parts from Tesla, having to keeping disassembled cars onsite for multiple months and dealing with upset clients, so they decided it wasn't worth their hassle. At the link in the prior comment it mentions that Tesla has their own body shop in Houston, though it's one tagged with "These centers currently only repair minor/light collision damage." The appraisals only $1057, which seems minor to me, so I sent Tesla the appraisal and some photos to see if this is something they can repair. Tesla said yes, their Houston shop can fix it. They requested more info and are working up an estimate. After I receive it we'll schedule the repair.